Minister of State (Independent Charge) for Skill Development and Entrepreneurship, Shri Rajeev Pratap Rudy has launched the “Transnational Skill Standards” in India. This initiative has been taken to support two important proposals that the Government had started much earlier, which are “Make in India” and Skill India”. These were started to align to skill standards which are recognized globally. These standards in skill development are benchmarked to United Kingdom across 82 identified job roles. After announcing the new initiative, 2 Memorandums of Understanding (MoUs) were signed between National Skill Development Council (NSDC) and Association of Colleges (UK) and NSDC and UK Awarding Organization City & Guilds and Pearsons Education. These MoUs were signed with the aim to enable sharing of best practices, staff exchange and development of new models to increase employer engagement and investment in skills in India. 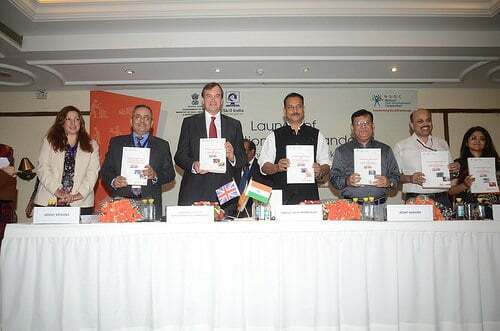 The Transnational Standards will highlight the gaps in Indian Standards against the UK standards. To cover the gaps, those intending to migrate, will undergo bridge training. The Further Education Colleges (FE) of the United Kingdom will partner with Indian Training Providers to impart training on bridge courses. FE Colleges to set up Skill Academies of Excellences in the identified sectors in India.